Epidermoid cysts are rare, slow-growing, congenital, space-occupying lesions accounting for 0.2-1.8% of all primary brain tumors. Epidermoid cysts involving the brainstem are extremely rare, with only 18 reported cases in the literature and only five purely intrinsic epidermoid cysts within this group. Typically, epidermoids appear hypointense on T1-weighted magnetic resonance (MR) images, and hyperintense on T2-weighted sequences. Rare "dense" or "white epidermoids" have high protein content and show reversed signal intensity on MR images, with high signal intensity on T1-weighted images and low signal intensity on T2-weighted images. Here, we report an interesting case of intrinsic brainstem "dense" or "white epidermoid cyst" in a 15-year-old girl. The clinical presentation, radiological imaging, and surgical management are discussed, along with a review of pertinent literature. A 15-year-old girl presented with a one-year history of progressive quadriparesis, diplopia, dysphagia, dysarthria, and unsteadiness of gait with frequent falls to either side. Her neurological examination revealed upper motor neuron type of quadriparesis with multiple cranial nerve involvement (V, VI, IX, X, and XII). There were no clinical or laboratory signs of infection. Brain MR imaging (MRI) demonstrated an atypical intra-axial pontomedullary lesion, which had a high T1 signal, a low T2 signal, and subtle contrast enhancement [Figure 1]. Initial working diagnoses included intrinsic brainstem astrocytoma and cavernoma. For further confirmation, a diffusion-weighted imaging (DWI) sequence was obtained [Figure 2], which revealed a bright signal within the tumor suggestive of an epidermoid cyst rather than a cavernous malformation or brain tumor. The patient underwent a midline suboccipital craniotomy. On splitting the vermis, the floor of the fourth ventricle was exposed and found to be distended from the underlying cyst. A myelotomy was performed through the thinned-out floor, revealing a pearly white, viscous substance that was resected gross totally with the aid of micro-neurosurgery. Postoperatively, the patient experienced mild, transient sixth cranial nerve palsy that resolved completely within several weeks. Postoperative computed tomography (CT) scan confirmed the intraoperative impression of gross-total removal [Figure 3], and histological testing confirmed the presence of an epidermoid cyst. Epidermoid cysts develop slowly, and the onset of neurological symptoms is usually gradual. Patients harboring these cysts typically become symptomatic between the ages of 20 and 40 years. , Due to the insidious manner in which these grow, brainstem epidermoid cysts in children are extremely rare and have been reported in eight cases only. The pathogenesis of true intra-axial brainstem epidermoid is unclear and usually not considered in the preoperative differential diagnosis of brainstem tumors. Although considered as histologically benign, epidermoid cysts can cause significant neurological defects by compressing vital structures. Patients presenting with intrinsic epidermoid cysts commonly exhibit symptoms related to the compression of associated brainstem structures. In the present case, the presentation suggested lesion enlargement that resulted in pyramidal tract involvement, multiple cranial nerve palsy, and balance problem. The best diagnostic clue is a cerebrospinal fluid (CSF)-like mass that insinuates within cisterns, encasing adjacent neurovascular structures. Typically, epidermoids appear hypointense on T1-weighted MRI scans, but might also have an intermediate intensity between the brain and CSF on T1, whereas they are usually hyperintense on T2-weighted sequences. , However, signal intensity can be variable depending on the relative amount of lipid, cholesterol, keratin, and proteins and seldom show contrast enhancement. Rare "white epidermoids" have high protein content and may appear hyperattenuated on CT scans. Compared with the classic epidermoid cyst, these "dense" or white epidermoids show reversed signal intensity on MR images, with high signal intensity on T1-weighted images and low signal intensity on T2-weighted images. 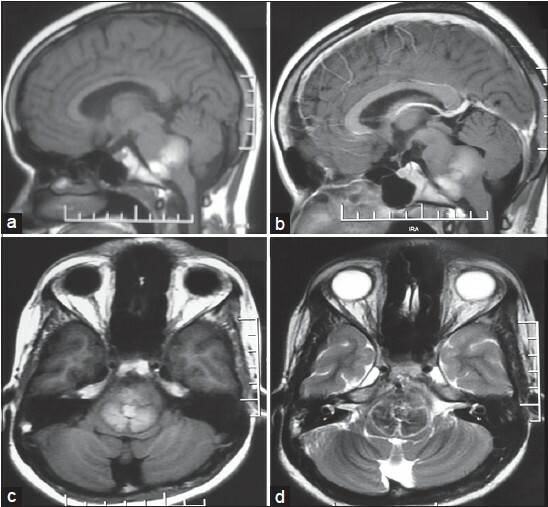 The rarity of brainstem epidermoid cysts can make their diagnosis difficult; thus, the use of modern MRI techniques, such as DWI and fluid attenuated inversion recovery (FLAIR) imaging, might be helpful in establishing the diagnosis in such cases. They do not suppress completely on FLAIR images and restrict (show high signal intensity) on DWIs. In our case, the radiological presentation was unusual, fitting rightly to the rare type of "white epidermoids". Although there appears to be a consensus about surgical resection being the best therapeutic option for the treatment of epidermoid cysts, these tumors pose a surgical challenge and attempts for aggressive removal of the cyst wall are fraught with increased risks of morbidity and mortality. On the other hand, cases treated more conservatively show good or excellent results with minimal complications. Nevertheless, Ziyal et al. pointed out that surgical resection should be as radical as possible. Neurosurgical judgment at the time of surgery is warranted to ensure maximum resection while minimizing postoperative neurologic deficits. Childhood onset purely intrinsic white epidermoid cyst involving the brainstem is very rare. 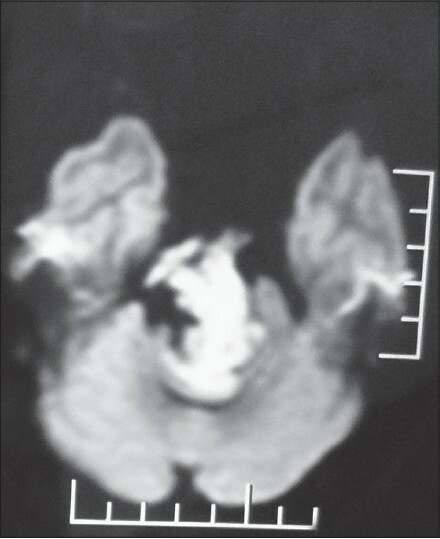 The use of modern diffusion-weighted MRI techniques might be helpful in establishing the diagnosis in such cases. Neurosurgical judgment at the time of surgery is warranted to ensure maximum resection while minimizing postoperative neurologic deficits. 1. Katzman GL. Epidermoid cyst. In: Diagnostic Imaging: Brain. Salt Lake City, Utah: Amirsys; 2004. p. I-7-16. 2. Recinos PF, Roonprapunt C, Jallo GI. Intrinsic brainstem epidermoid cyst. Case report and review of the literature. J Neurosurg 2006;104 Suppl 4:285-9. 3. Berger MS, Wilson CB. Epidermoid cysts of the posterior fossa. J Neurosurg 1985;62:214-9. 4. Cobbs CS, Pitts LH, Wilson CB. Epidermoid and dermoid cysts of the posterior fossa. Clin Neurosurg 1997;44:511-28. 5. Toglia JU, Netsky MG, Alexander E Jr. Epithelial (epidermoid) tumors of the cranium. Their common nature and pathogenesis. J Neurosurg 1965;23:384-93. 6. Ulrich J. Intracranial epidermoids. A study on their distribution and spread. J Neurosurg 1964;21:1051-8. 7. Caldarelli M, Colosimo C, Di Rocco C. Intra-axial dermoid/epidermoid tumors of the brainstem in children. Surg Neurol 2001;56:97-105. 8. Ziyal IM, Bilginer B, Bozkurt G, Cataltepe O, Tezel GG, Akalan N. Epidermoid cyst of the brain stem symptomatic in childhood. Childs Nerv Syst 2005;21:1025-9.